FDA's graphic cigarette warning labels: Beyond free speech? (CBS/AP)The FDA's plan to force tobacco companies to slap gruesome images on its cigarette packages is on hold, thanks to a judge who blocked the new federal requirement on Monday. U.S. District Judge Richard Leon ruled in Washington on Monday that it's likely Big Tobacco will succeed in a lawsuit to block the new warning labels, so he stopped the requirement until after the lawsuit is resolved. That could take years. The cigarette makers that sued the FDA are R.J. Reynolds Tobacco Co., Lorillard Tobacco Co., Commonwealth Brands Inc., Liggett Group, and Santa Fe Natural Tobacco Co. They say their products have had medical warnings for more than 45 years, adding they have never filed a legal challenge against them until the new images were approved. A similar case is also pending before the U.S. 6th Circuit Court of Appeals in Cincinnati. Leon found the nine graphic images approved by the FDA in June go beyond conveying the facts about smoking's health risks and veer into advocacy - a critical distinction in free speech cases. The proposed packaging would include graphic depictions of a man exhaling cigarette smoke through a tracheotomy hole in his throat, a diseased mouth covered with lesions, and a cadaver on a table with post-autopsy chest staple. Those labels can be found here. "It is abundantly clear from viewing these images that the emotional response they were crafted to induce is calculated to provoke the viewer to quit, or never to start smoking - an objective wholly apart from disseminating purely factual and uncontroversial information," Leon wrote in his 29-page opinion. Leon pointed out some photos used in the labels were altered to evoke emotion. He also said the FDA requirement that labels were to cover the entire top half of cigarette packs, front and back and include a number for a stop-smoking hotline, may be unconstitutional. Leon said the labels would amount to a "mini-billboard" for the agency's "obvious anti-smoking agenda." The ruling is "wrong on the science and wrong on the law," said Matthew Myers, president of the Campaign for Tobacco-Free Kids. He urged the Obama administration to appeal the ruling and said a delay would only serve the financial interests of tobacco companies that spend billions to downplay the health risks of smoking. "Studies around the world and evidence presented to the FDA have repeatedly shown that large, graphic warnings, like those adopted by the FDA, are most effective at informing consumers about the health risks of smoking, discouraging children and other nonsmokers from starting to smoke, and motivating smokers to quit," Myers said in a statement. "Because of that evidence, at least 43 other countries now require large, graphic cigarette warnings." 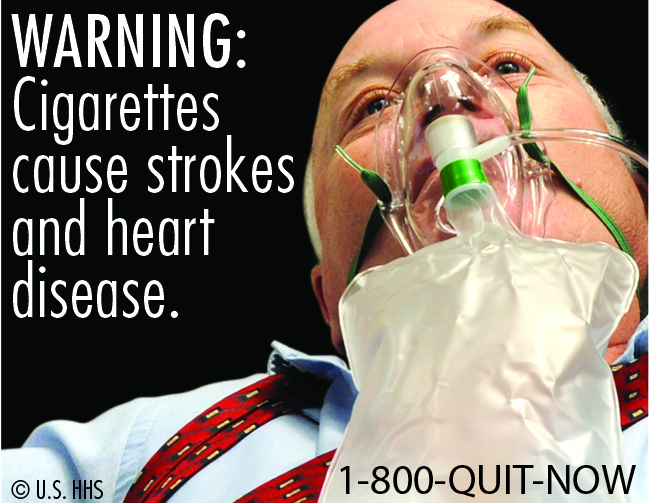 Tell us what you think: Did the FDA overstep its bounds with its new tobacco warning labels? Click here to check out gruesome tobacco warning labels from around the world.